SSP Direct have been heavily involved in the supply of standard and personalised visitor pass systems for many years, providing visitor and contractor systems for schools, colleges, businesses and the other organisations up and down the UK. All of the standard pass systems and ancillary products shown in this section are available from stock. In most cases if you order a school visitor pass system, a contractor system or standard visitor pass system before 1.30pm, Monday-Friday, your products will be dispatched on the same day. The same is true of many of the backboards, lanyards, wallets and clips, folding backboards and pens sold in this section. Over the years, we have also worked with many private businesses and schools in producing personalised visitor pass systems, showing both their logo and relevant information relating to their building. This information covers everything from their building-specific fire procedures and health and safety information through to safeguarding polices. In effect - working within the constraints of the size of paper - we can print almost any style of visitor pass system you want. Are our visitor pass systems compliant with all data protection legislation? In a country with ever tightening data protection legislation, we do everything possible to make sure all of our visitor systems meet the latest requirements. Since the introduction of the Data Protection Act in 1998, we have offered visitor systems that have what we refer to as a discreet sheet. This is a sheet that divides the passes that visitors wear from the list of all visitors that day, week or month underneath. In more recent times, we have also done all we can to ensure our systems meet the more stringent requirements of GDPR (General Data Protection Regulation), which came into force in 2018. This legislation tightens up on who could possibly have access to lists of visitors to your building. 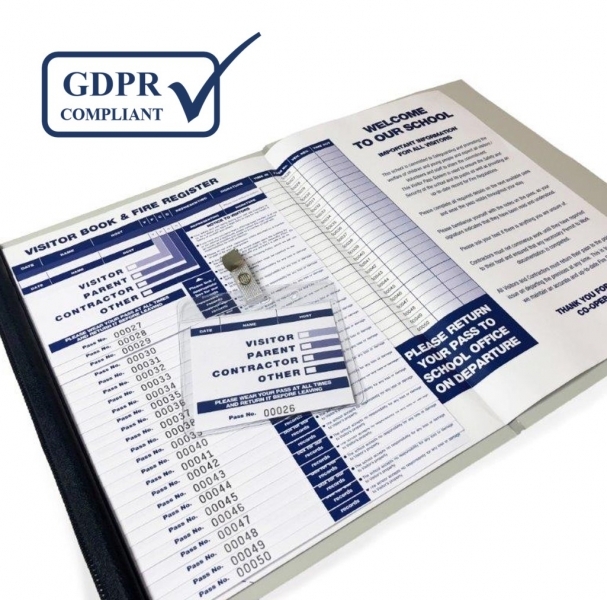 Whilst our systems with a discreet sheet all comply with legislation, we make a point of telling our customers they must have a way of ensuring their visitor systems are in manned areas of their building. In other words, a responsible person must be on hand to ensure the list of visitors is not either removed or read by others. If the area is left unmanned for any length of time, the authorised person should remove the visitor system from display. How easy is it for visitors to view a list of previous visitors to the building with your standard Visitor Pass System? No, not easily. This is one thing that sets our standard system apart from others. Below each pass there is a blacked out sheet that prevents new visitors viewing the information sheet containing the names of others who have previously visited your building. This is not only the right thing to offer businesses to protect the privacy of previous visitors, it is also completely in line the GDPR 2018 and UK’s Data Protection Act 1998. It is simply unlawful for business to make this list of visitors available to others without prior consent. However, as stated previously, these systems should only be used in manned areas of your building. Does your Discreet Write system have a sign out box? Yes. In line with the Regulatory Reform (Fire Safety) Order 2005, businesses should know who is in their building at any one time. In line with their own fire risk assessments, they must be able to safeguard visitors who enter their premises. They can only do this if they know who is in their building at any given time. In the worse-case scenario, it is incredibly dangerous for a staff member or fire fighter to run back into a burning building attempting to save a person who left the building earlier that day. The sign out box is vitally important – although it is only as good as the information it holds. As such, keeping it up to date is essential. How can you use the Discreet-Write System as a fire register? Each Visitor Pass system is made up of three key elements. The 25 passes on the top, where visitors, parents and contractors sign in. Underneath this is the discreet-sheet that conceals the third element, the information back sheet. On the right hand side is the information panel that can be used to advise on Health and Safety procedures and Fire Evacuation routines. To the left of this is a grid that contains a complete list of those that have signed in (and out) during the days, weeks and months. It is this grid of names that can be used as a fire register in understanding who should be accounted for in the event of an emergency. Do any of your visitor pass systems contain safeguarding information? Do you have a system that relates to supervising the visitors to your site? All visitors wait in reception until they are met by an appropriate member of staff to be escorted either around the building or to their destination. How do I personalise a Visitor Pass System? We can adapt any one of our standard Discreet-Write systems to show your organisation’s logo, health and safety procedures and fire routines. Also, if your building has a specific unique message that must be relayed to all persons visiting, we can incorporate this on your customised Discreet-Write visitor pass system. For the personalised system, the only version of my logo I have is pretty poor quality. Can you still print my passes? Yes. We employ a full-time designer that can work with you and enhance any existing designs in accordance with your requirements. Why does it cost more for two colour personalised visitor passes than it does for one colour passes? Many of our visitor passes are printed using a litho process. This can only apply one colour at any one time. This means that in order to print two colour passes, the same pieces of paper have to be fed back through the printing presses to produce the final product. This is quite a labour-intensive process that does unfortunately add to the cost of production. Can you print on the reverse of the visitor passes? Yes we can! Customers often ask if we can print their fire escape / evacuation plans and procedures on the reverse of their passes. We think that this is a great idea. After all, an individual who is visiting your business for the first time will be far less familiar with the layout of your building than regular members of staff that are there every day. As such, it is these people that will need more information in the event of a fire or other emergency. Having this information printed on the reverse means it is easily accessible by every visitor at any point. We can also print anything else you require. The cost of doing this is priced as if we are printing another colour. For more information, call us on 0161 413 7939 today. 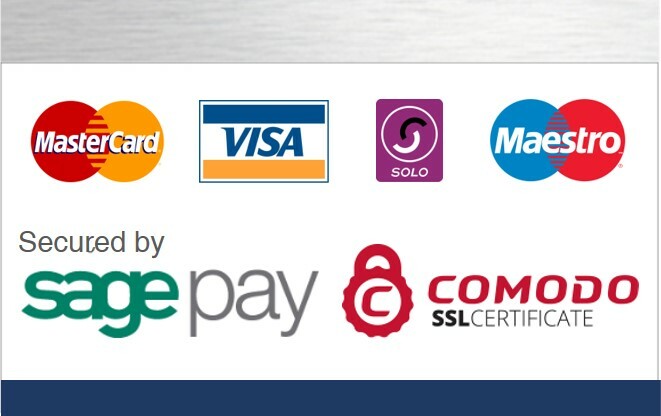 By One Colour and two Colour, do you mean just the logo or the logo and the text? The latter: the logo and the text. Often customers who have, say, a dark red logo will also choose to do the Health and Safety / Welcome text in this colour. They may choose to do this for two reasons – one - aesthetics; it looks better and two - cost; as this would only be deemed a one colour job, it is less costly to print. However, if you have a blue logo and want black text, this will be priced as a two-colour job, due to the printing process as detailed above. I don’t want to use the system for visitor passes. Can I use it for something entirely different? You would not be the first to request this. One customer recently ordered the system to give visitors tickets into their leisure centre. In truth we are not too precious about what our system is used for. If you can think of a potential application, we are more than happy to work with you on producing a unique system to fit your needs. I want to include a disabled symbol, split the name boxes so it says forename and surname and remove the organisation sign-in box altogether. Can this be done? Absolutely. The only constraint we have is the shape of the paper that we are printing onto. Put simply, we can change the layout and text formatting as you see fit. If you want your logo and strapline printed on every pass, we can do this. Ultimately, you are the customer and we are your printers. We are more than happy to print whatever you want, and work with you to achieve this. If I ask you to print customised visitor passes, will each pass be numbered? Yes, that is standard procedure. This may help you manage and track your visitors. Even if you cannot read your guests' handwriting, utilising the numbering system you can quickly work out who potentially is still in your building by checking the passes you have had handed back in that day. It worries me that I will design my system online, pay a lot of money and then three weeks later I will get a visitor or contractor pass system that is nothing like I expected? Our golden rule is never, ever print anything until the customer has seen and approved the finished artwork. Once we receive your order, any unique text and your logo, we will mock up a printer’s proof. This will then be emailed to you in a PDF format for you to either approve or advise on any amends. We will happily make as many drafts as needed. In 2016, one customer came back 16 times to amend and tweak his design. In the end he was happy and we were incredibly grateful for this business. We still print his passes today, with both sides very happy that we went through the pain of getting it right in the first place. Whatever happens, we will certainly not print anything until you are 100% happy. When I come to re-order / re-print my visitor passes, will I have the opportunity to ask you to make amends to my artwork? Many customers do exactly this. Often, they realise that after a few months of using their visitor pass system that their welcome message is not quite right or perhaps the information boxes do not capture all the necessary information. Any amends will be treated in the same way as we did at your first print run. We will make the amends and email you a PDF for your approval. Only once you are 100% happy with this artwork will we print your finished product. There is no extra cost for doing these amends. The refills price on this website is the refill price – regardless of how much re-working of artwork we have to do. How long does it take to print customised visitor pass systems? Once ordered, we will usually have an initial draft set within 24 hours. Once any amendments to your design have been made - and you have given final approval, it will take around another 10 to 15 working days (or 2 to 3 weeks) for us to print your visitor or contractor passes and send them out to you. If these are ordered and paid for directly from this website, carriage on all personalised visitor passes will be completely free of charge. Can I ask you print my organisation's Visitor Passes using our preferred font? As long as the font is not entirely bespoke to your organisation and is available for us to source, we can print your visitor passes using whatever font you prefer. The most common fonts seem to be Calibri, Helvetica and Frutiger currently. I have a logo that is two shades of the same colour blue. If I also do the text in this blue, is this a one colour or two colour print job? In these instances, we would need to have a look at your logo. But invariably in this scenario, this ends up being a cheaper one colour print job. It looks from your pricing that the more you buy the cheaper it is per pass. That doesn’t really seem fair!? We agree. In an ideal world, the person with the most money should not necessarily get the best deals. However, the majority of the cost associated with printing these products is the setup of the printing presses themselves. Once the printer is running, the economy of scale is such that it is always cheaper per pass to print 5000 visitor passes than it is to print just 500. That said, we do our best to keep all prices down and competitive. Can you print my organisation’s name along my lanyards? What about my school’s logo? Yes and Yes. We are well used to doing this. As with many things printing related, the more passes you buy the cheaper it is. We would be more than happy to do this for you. How do I know which wallet and clip goes with which visitor pass system? The larger 9.5cm x 8.5cm (internal measurements) wallets go with SSP’s own Discreet Write system. The smaller “credit card” wallet and clips is only used on our simplistic 300 pass system. You can usually find the correct wallets in related products. What should you do if you only want a signing-in book rather than a visitor pass system? Many customers have and want nothing more than a sign in book, similar to the product shown at this link. Unfortunately, this is not acceptable under the GDPR, as any subsequent visitor can see the names of people who have signed in previously. This goes against the very essence of the legislation, as you are sharing people’s personal information with other visitors. It is for this reason that we have introduced our own range of blacked out sign-in books. These are designed to conceal the names of visitors. All visitors simply write the names on the blacked out areas on the top sheet, along with their initial and time in and out. Whilst no name can be read on the top sheet, a full list of names is duplicated onto to the concealed sheet below. This sheet can then be used by the responsible person should there be a security breach or should the building be evacuated in the event of a fire or emergency.